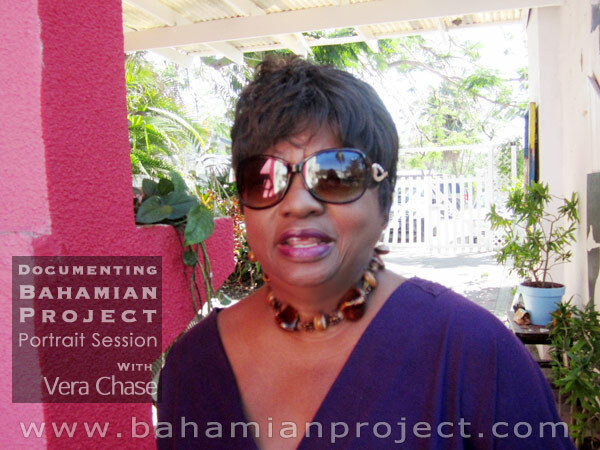 This picture of Vera Chase was taken as she arrived for her portrait session for the Bahamian Project. The final portrait images will be unveiled at the Exhibition Opening at the National Art Gallery of The Bahamas on July 11, 2013. “I am in love with Bahamian history,” said Vera Chase. Vera is a retired banker, having spent 36 years in the field. Her true love, though, is writing, particularly about Bahamian life in eras of the past. She is a published author, writer and researcher of early Bahamian history. She is a member of The Bahamas Historical Society and President of The Commonwealth Writers of The Bahamas through which she is deeply involved with the mentoring of student writers. She is the author of two books of short stories and poems, “Take Me Back To Guanahani” and “Pirates Paradise”. Both books are a combination of history and fiction. Facts brought to life through her imagination. She knows her history. Inside and out, like it was happening today. During her photo session for the Bahamian Project she was practically bubbling with information and stories… about island life in the days of the Arawak Indians… about emancipation and the lives of the slaves… about the loyalists in the Bahamas and the politics of the late 1700s – it was as if she was telling us about people she knew, things she had experienced. I mentioned to Vera my ancestor’s name, John Wells. He was the publisher of the first newspaper in The Bahamas – The Bahama Gazette. I know a bit about him but she told me even more. She said that in researching her own “Poitier” family name and history over the years she had also learned about the ancestors of the many other families that make up Bahamian society today. She traced her own family history back to England. As for John Wells, she told me where he is buried – which I had not previously known but now that I do, I think I might pay a visit. Thank you Lisa and Duke for this fine Exhibition celebrating Bahamians and the 40TH Independence Anniversary of the Bahamas.